Yale Law School canceled 31 classes this week so that students would have a better opportunity to protest Brett Kavanaugh. 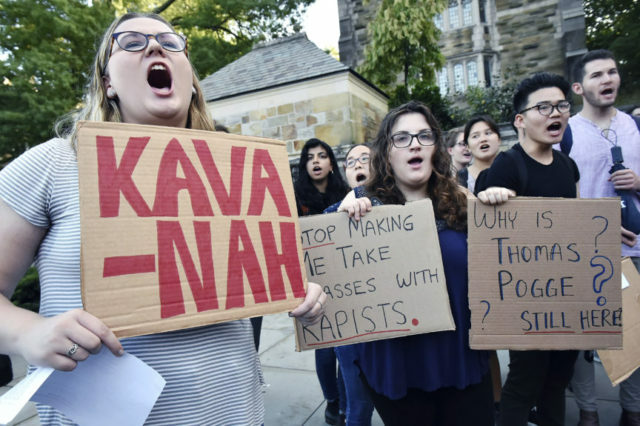 Professors at Yale Law School canceled 31 classes on Monday so that students would be better able to protest Brett Kavanaugh’s nomination to the Supreme Court. A report from the Washington Free Beacon detailed some of the cancellations. James Forman, a criminal law professor, canceled classes after hearing that some students were traveling to Washington D.C. to protest Kavanaugh. On Monday, Yale Law School students gathered in a campus building wearing only black to demand a full investigation into the accusations. Many of the students were able to participate in the sit-in demonstration because their classes had been canceled. Yale professor Nicholas Christakis, who was at the center of the Halloween costume controversy at the university, criticized the student protesters on Twitter. “For civil disobedience to be praiseworthy and serious, protestors must be willing to bear the costs of the then-extant sanctions. Cancelling class so that students can protest, and doing so only for one end of political spectrum, seems hard to defend,” Christakis tweeted. Nearly 50 Yale Law School faculty have signed a letter to the Senate Judiciary Committee demanding a full investigation into the accusations against Kavanaugh. This entry was posted in Politics and tagged Brett Kavanaugh, Kavanaugh on September 28, 2018 by Bone Fish.